Designed by a firefighter for emergency services to use this original door chock is the worlds only ‘Fold-Up’ Door Chock. The Fat Ivan® door chock has proven itself a vital tool for virtually all fields of operation including Fire, Police, Commercial, Residential, Hotel/Motel and all deliveries. The FatIvan is extremely easy to use as it can be operated with just one hand. It opens quickly and easily enables rapid insertion to the door hinge, due to its unique design it is guaranteed to never slip off a hinge and drop. It's safely attached to the hinge holding the door open until you decide to remove it. 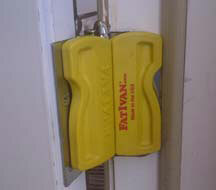 The new FAT IVAN®, is an evolutionary way to keep prevent a door from unnecessarily closing in any situation. 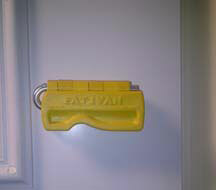 Firefighters need to know that their door chock will work and that a door won't close and endanger them. The FatIvan folds up neatly to be placed in a pocket and is so unobtrusive you won't know it's there until you need it again. 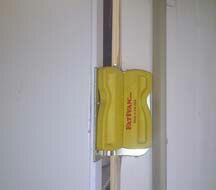 This door chock works on virtually all door hinges. Chose the FatIvan with magnets to ensure it will work on every door. Great to use in many ways possible. Use almost on a daily basis and know it will work every time i need it to. I've used wooden door chocks since I joined the fire service and they always worked so I was iffy about trying this at first. Finally went ahead and ordered myself one. Greatest thing I've ever bought. Works EXACTLY like it says it does. Tested it out real well once I got it and it was holding up some very heavy steel doors without a problem. The chock itself is extremely strong. Ran it over with a KME engine and it still works perfect. 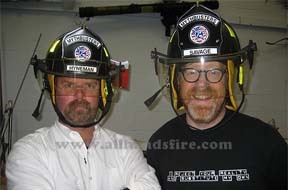 Now own 2 of these and recommend these to anyone in the fire service. This is a wonderful tool to have in your pocket. It is lightweight and does not take up much room. The way it folds up keeps it compact. It will keep the door wide open with no chance of closing. I showed the guys at my firehouse and they loved it.